2000 Fleetwood Bounder 36Ft Class-A Motorhome. This motor home just took us on a trip of a lifetime. 16,000 kms across the eastern states and Canada. It had new tires installed before we left. Big slide out. Dual air conditioners. Onan 5.5 kW generator. seat belts for 8. 454 chev engine. Runs good. Awning new last spring. Lots of storage in and under unit. 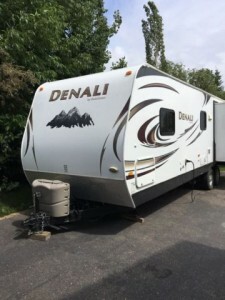 Might be willing to trade on a used travel trailer or fifth wheel. Please call 204-960-9219 to view. 14. Cable and Satellite prep. Please call 250-417-7370 to view. 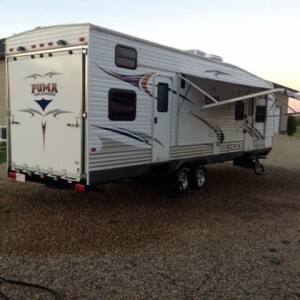 2011 Palomino Puma 30DSU Toy Hauler. Excellent condition. Re-fuelling station. Pressure washing station. Electric awning. 2 queen size power bunks in 10ft garage. Screen-in garage door. Big dining room slide. Lots of storage. Please call 780-918-3475 to view. 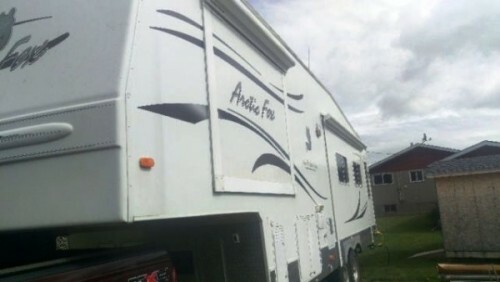 2008 Artic Fox Silver Fox Edition 32Ft Fifthwheel. 4 Season 5th wheel for sale. Has 2 slides, bed slide and 12ft slide in living space, large fridge, stove, oven, microwave, 2 good size kitchen sinks, storage under bed, front closet for extra of storage. Has a fireplace, TV, air-conditioner, built in vacuum, fantastic fan with remote, ceiling fan. 2 - 40 lb propane tanks, built in 5500 Onan generator, heated tanks in the underbelly, 60 gallon water tank, 20' awning, awnings over slides as well. Lots of storage, excellent condition. Please call Art @ 780-573-2136 to view. Top of the line air ride hitch. Fireplace and TV. DVD/VCR. Large shower/ bathroom with lots of space. Queen size bed plus queen size hideaway bed. Brand new 14 ply tires as well as new shocks. Axles have been straightened and the trailer has zero tire problems. Interior is in immaculate condition. Lots of storage underneath with easy access. Outside shower. Also comes with satellite dish and all hookups to watch satellite TV. Please phone 403-931-3217 to view. 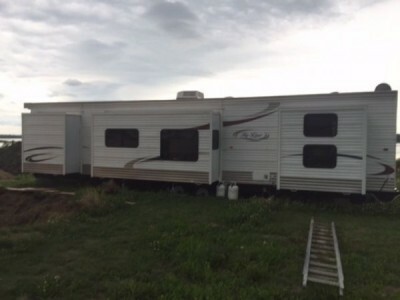 2007 Forest River Cedar Creek 362BTS Fifthwheel. 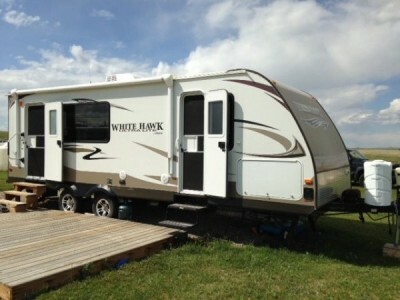 Triple slide, bunk model, washer and dryer, built in vac, rain sensor fantastic fans, brand new tires and suspension. please call 780-952-7224 to view. 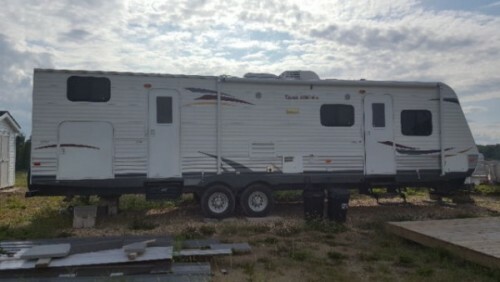 2012 Heartland North Country 32BH Trailrunner Edition Trailer. 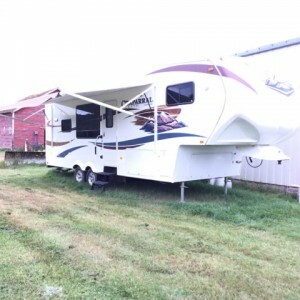 Family friendly 2 bedroom 32 ft double slide out Model 32BH RV. All the features of home in this roomy unit. Features a children's entertainment area with 3 bunks (one is a sofa that converts) media centre holds 32" TV and game console (receptacle and cable outlet) Bathroom includes full shower, vanity and medicine cabinet with lots of room and an exterior door. Living area has a large slide out with 3 side seating around the table and a sofa, both provide large storage capacity and extra sleeping quarters. 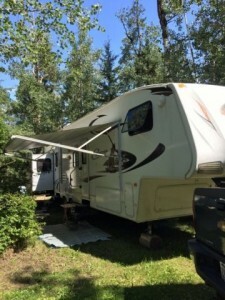 Full kitchen includes double sink, Microwave, Furnace, Air conditioning, hotter heater, sink and a fridge (Propane/120v) Master bedroom has a queen size bed with overhead storage cabinets as well as under the bed compartments. 2 Propane tanks, 12volt RV battery included. 2 Large lockable exterior storage spaces. Electric braking system. This unit was bought in Aug.2012 and towed to Pigeon lake where it was set up on a lot, winterized and stored in place. Last fall moved to Dorchester Ranch RV and Golf resort where it now sits on our lot with a For Sale sign, we have purchased a Park model and this is the reason for selling. The RV has 2 years remaining on the transferable warranty. Priced to sell! Please call 780-404-6139 to view. 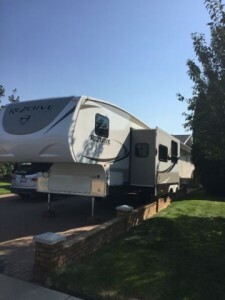 2010 Keystone Outback 268RL Trailer. Popular Rear Living room floorplan model makes this the trailer. Perfect Couples Coach. Double Door Entry System. Very Clean and well kept. Pull down accordian Blinds. Very light/bright & open trailer. Super Slide. Artic Package. Mini Outdoor Kitchen. All in One Entertainment System. Spining TV. Beautiful condition in this hard to find rear living room Package. Don't miss out on all it has to offer including the Artic Package which allows for extending your camping season. Please call 403-984-8076 to view. 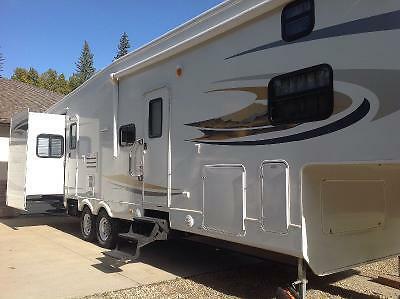 2010 Keystone Cougar 36Ft Fifthwheel. Very clean and comfy 5th wheel. Non smoking. Feels very spacious with the high ceilings in the main area because of the Loft in the back of the trailer. Private master suite with lots of closet space. It has a very spacious pantry. Sleeps 10. 2 Bathrooms - one with a shower and skylight above the shower - love this!! Outdoor shower, extra rear storage rack, 3 slides, 2 sky lights, a tonne of storage (in and out). Private back area with couch, tv, table, loft and washroom. Polar package, 13,500 BTU air conditioner, satellite/cable hook up. 30,000 BTU furnace, 2 propane tanks. Electric awning, black tank flush, day/night shades. An excellent trailer! You do not want to miss out on this beauty. If you need better/more pictures I would be more than happy to send them. Just email me! Thanks - year is 2010 Everything works perfectly! Please call 403-877-7797 to view. -4 Season: Upgraded windows and insulation, heated underbelly. Power and remote controlled Awning, Jacks, and slides. High end solid surface counter tops. 120V / Gas water heater. Power TV stand that tucks away. loads of Storage. Sleeps 6 (Queen, Couch Airbed, Large Dinette bed. A/C. Half Ton Towable. 7321lbs Dry Weight. Original Owner. Sticker price was $52,900 new. Porcelain Toilet. Residential Style Corner Shower. Black Tank Flush. Outside Hose. Propane Quick Connect. Comes with Hitch, Baterry, 2x 20lb propane bottles. Large Fridge. Open to Reasonable Offers. Willing to consider trade on truck box camper of similar value or lesser value plus cash for a 6.5ft box. No PayPal or Soliciting. Bumper tow slide out 30 28 hard side travel trailer trade. 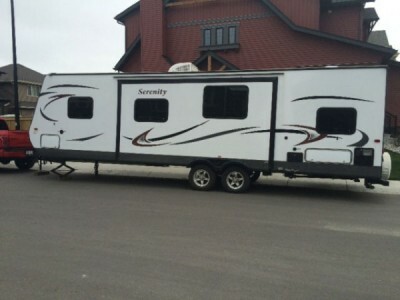 Please text @ 780-201-6746 if you would like a video of the trailer inside and out. 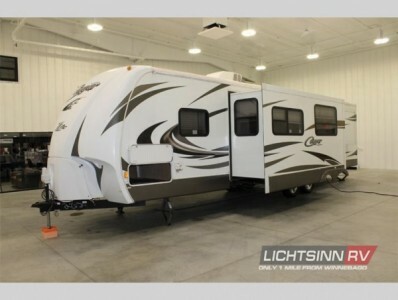 2011 Coachmen Chaparral 275RLS Fifthwheel. Up for sale is a Triple Slide, Light weight (@ 8120lbs Dry), Fifth Wheel that I have easily pulled with my 2006 GMC 2500 SRW Duramax. EXCELLENT Floor Plan...for those that have owned previous trailers....you know. Outdoor speakers with 3 zone selection: outside, main or bedroom. Huge under Bedroom storage area for all your camping gear. Lrg Under nose storage perfect for BBQ and a few other items. Recessed Door/Cabinet from outside Trailer for hose connections and Black-Grey Pulls....Black Tank Flush Built in & room for a Water Filter. 50‘ of white water hose. Std. dinette with storage underneath. Roof Ladder & Wooden Step Ladder. Porcelain Toilet - New in 2016 (I screwed up De-winterizing and blew the valve on the original)...the New Toilet matches the sink. Included in Sale is a PullRite Super Glide 16k Sliding Hitch... (www.pullrite.com), which is simply phenomenal in that you DO NOT have to get out of your truck to slide the hitch back...it does it all on its own. Perfect for short box trucks and you can do up to 110 deg turn if required. This hitch will fit Industry standard Rails. B: is that the bedroom has two entrances that can both be closed for privacy should you have guests staying the night. Look at the floor plan and you will see a sliding door in behind the vanity. I'm also told by a number of my friends that have used the blow up bed in the couch, it was the most comfortable air bed they had ever slept in.. !! This RV is in excellent shape and pulls extremely well. I've taken it to the Shuswap area of BC twice (2014/2015), and to local area Provincial parks in the Calgary/Red Deer/Canmore area's. No Gravel Roads. 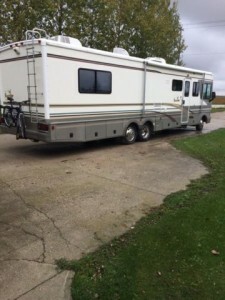 Purchased in 2014 for $28,950.00 From Bucars RV. Stored at Stampede RV Storage just west of Balzac on Highway 566. Kindly Contact me for Viewing Information. Text or E-mail pls. Low Ballers do not bother - am in no rush to sell this trailer. 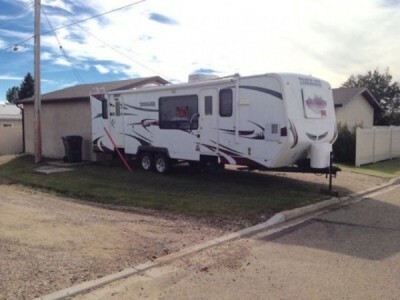 Price is relatively FIRM... Good Value - Great Trailer. Cheers & Thanx for looking. Kindly Contact @ 587-580-6483 for Viewing Information. 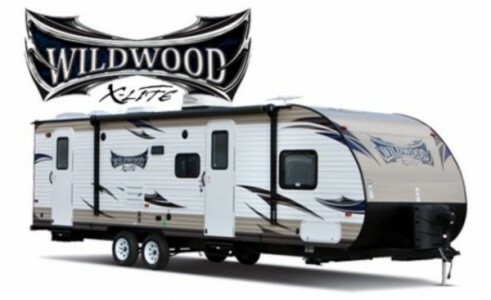 2014 Forest River Wildwood 262BHXL Extra light Trailer. This Trailer is still in show room condition, hasn't been used more than 5 times in two seasons, this is why we have decided to list it. This trailer tows very easy behind my 1/2ton truck. Perfect size for a family, one queen bed in the front with sliding doors for privacy and two double bunks at the back for kids, we used the bunks for storage since we don't have kids.. 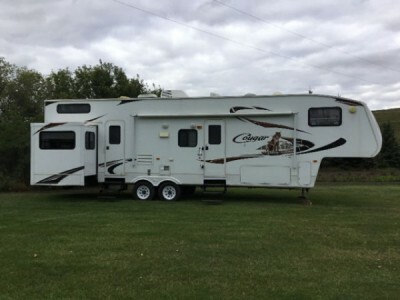 Very large trailer with a full sitting area slide, with the top of the line interior which includes a leather couch that makes into a bed and fold down dinette table that makes into an additional bed. Everything is push button or remote like the flat screen TV, Awning, front jack, stabilizing jacks, and slide. Rear bathroom has access door from inside or outside. Storage area has an 8ft slide box to easily storage and pull out all camping accessories. Lots more pics to share if wanted and the full line of specs to share if wanted. Lots to love about this unit, you will love it. Please call to view. 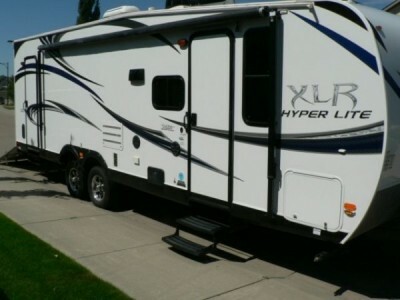 2013 Forest River XLR Hyperlite 27HFS Trailer. 30ft with hitch. Ship weight 5786 lb. Cargo capacity 4273 lb. Hitch weight 992. 9ft separate garage. Spring assist ramp door with non-skid surface. Queen bed in front, Queen bed in garage. One Hydraulics plus table makes into bed. Like new condition. Nice entertainment area with outdoor speakers. One price rubber roof. We are selling because we don't use it enough (Only once this year). Really nice unit. Half ton towable. Please call 587-521-8099 to view. No Texts Please. 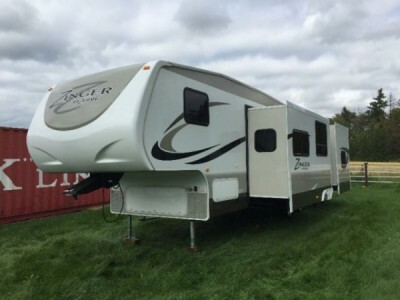 2009 Komfort TrailBlazer Trailer. 28.5ft trailer. Well built. Mint condition. Everything works well. Walk around queen bed. Couch and two chairs. Sleeps 4. Full size shower. Free standing dinette. Tires are in good shape. Fridge, dinette, and couch slide out. Tons of room to entertain or set up crib. Couch pulls out into double bed. Please call 403-396-3812 to view. 2012 Hyline Park Trailer 44Ft Trailer. Designer Décor package. Double insulation (floor and ceiling). 3 all season push-outs (6ft, 6.5ft, 13.5ft). 2 bedrooms, queen bed with assist lift, jack and Jill bunks, Hide-a-bed couch, TV, entertainment center, stereo/DVD/CD w/sound bar, prep for satellite, 18 cu in full sized fridge, 24” deluxe range/stove, microwave, 15,000 Ducted Air, 40,000 Btu furnace, electric fireplace. 20 gallon electric hot water with by-pass plumbing. Detachable hitch. Full bay front windows, Patio doors with thermal pane. Power bath vent, automatic. Fantastic ceiling fan vent, 2 ceiling fans. Deep tinted radius windows, day/night shades. Brush nickel hardware, large angle sink and cover. Mortise and tenon solid wood cabinet doors (Port Cherry). Full mirrored wardrobe, extra wardrobe in kitchen, overhead cabinetry. Neo angled shower with skylight, acrylic sink bathroom/stainless kitchen. Tank-less hassle free design. Please call 780-975-5760 to view. 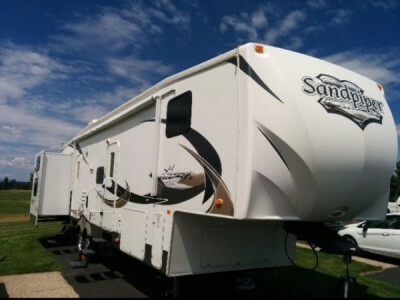 2010 Forest River sandpiper 355QBQ Fifthwheel. 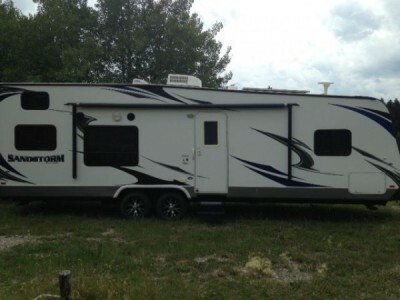 This incredible 5th wheel sleeps 10 people comfortably… with room to spare for more. It is in excellent condition, a must see! At 41’ 5” this unit has 4 slides, double bunk beds in the back, a spacious kitchen and sitting area, and a separate master bedroom. These custom options are factory ordered from the US. With today’s US Dollar exchange rate that ould cost an additional 35-40%! Option: Consider making a package and buy the truck and hitch, extra TVs and mounts, rear aluminum 5 bike rack as well. Please call 403-808-4609 to view. 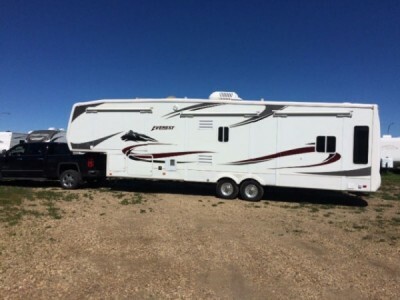 2013 Forest River Sandstorm T270SLR Toy Hauler. Like new, never had a toy in it since we sold them shortly after we bought the trailer. Our needs changed and we are looking for something a bit smaller and more suiting to our needs. We are happy to trade as well, but very specific of what we want. Can only be a Creek Side 27 with bunks or Timber Ridge 27 with bunks. The trailer includes all Standard Features. Most Popular Optional Equipment: 15K BTU Air Conditioner, ONAN Generator, Carpet Kit, Day / Night Shades, Living Room LED TV, Power Tongue Jack, Toy Lock system, Water heater by pass. The G-series package: Aluma Wall Fiberglass Exterior, Aluminum Wheels s/matching spare, Kicker Audio System, Power Awning, Corian Counter Tops, Fender Skirts, Radius Auto Mold. The Show stopper package: 155 Watt Solar Power Kit and Regulator, HDTV digital Antenna. Interior LED Light package- 360 Siphon Odor Extractor. The Arctic Package: Insulated and enclosed tanks, 12 Volt Heat Strips, Double insulation in Roof and Floor. And as a bonus there is another 4 years of extended warranty on it. l also changed all the regular light bulbs to energy preserving LED. The trailer has been winterized every year, the batteries stored inside and the tires rotated. Please call 403-459-9090 to view. 2015 Gulfstream Serenity 288isL Trailer. double bunks, island sink, two slides, private master, dual access doors. A must see! Please text. Please call 403-506-8463 to view. 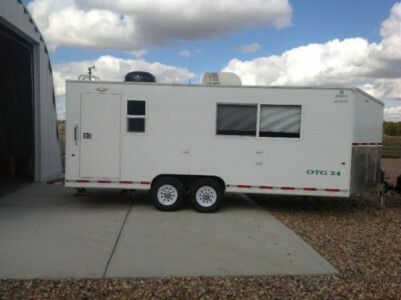 2013 OTG Office Trailer 24Ft Trailer. Bought New, Used 2 months, Cleaned and Stored Inside. Incinorator Toilet (never used), Auto Find Satellite w/TV, Hide-a-bed sofa, Fridge, Microwave, Vacuum, A/C, Electriconic Heat, Cell Phone Booster, Closed Off Entrance with Closet. Open to Reasonable Offers. Please call 780-853-0128 to view. 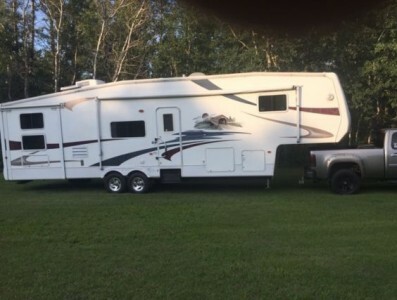 2010 Keystone Cougar 324R2B Fifthwheel. Sleeps 9, 2 bathrooms. A bedroom at each end with a loft at the back bedroom, 2 flat screen TVs, microwave, 3 slides, polar package and more. Please call 780-583-2281 to view. 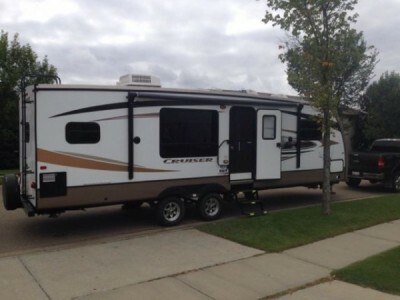 2011 Coachmen Chaparral Fifthwheel. Large slide in living area, electric awning, excellent shape Paid 42,000.00 Lots of extras. One owner. Please call 780-583-2281 to view. 2014 Crossroads Zinger 31BHF Fifthwheel. Double slide. Rear bunk. Outdoor shower. U-shaped dining area. Queen master bed. Outdoor bar w/ beer fridge. 2 entrance doors. Great family unit. New tires spring of 2016. Please call 403-801-8231 to view. 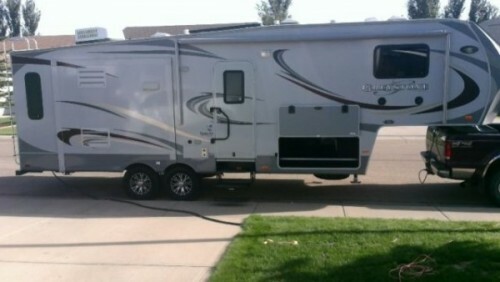 2006 Keystone Everest EV344J06 Fifthwheel. Fully equipped trailer in excellent condition. New tires, and suspension in the last 12 months. Can be viewed in Edmonton. Original owners!! Please call 780-720-4482 to view. 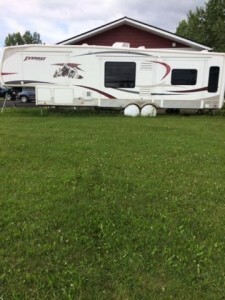 2009 Jayco Eagle 355FBHS Fifthwheel. Great family trailer! 38' overall length ! Sleeps 6-8 very roomy bunks, Lots of storage in the bunk room that is located in the front of the trailer and the master bedroom is located at the rear of the trailer with a half bathroom with access from the outside as well! Tons of storage throughout the trailer inside and out! Reason we are selling are kids are adults now and we are looking for a trailer slightly smaller and suitable for just the two of us! No pets, no smoking, trailer is very clean and well maintained! Can text 780-542-0594 or email if you have any questions. 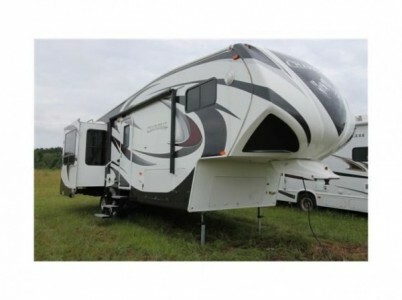 2012 Heartland Greystone 29MK Fifthwheel. This trailer is in mint condition, has 3 slides, sleeps 4 people and features power awning, power jack, internal/external sound system and a 120 watt solar panel. Please call 403-505-4743. 2015 Crossroads Rezerve 27Ft Fifthwheel. One large slide. 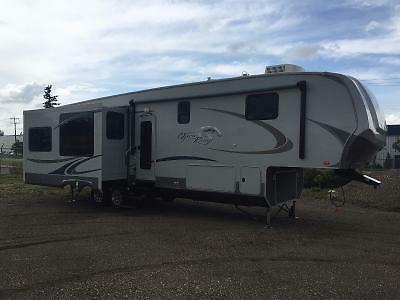 This unit has tons of room and storage it has 3 double bunks, enclosed underbelly, rear stab jacks, power front jacks, front fibreglass cap, welded on new bumper that has hitch for towing, outside shower, electric awning with lights, TV antenna, bedroom tv hook up, AM/FM/CD/DVD/player with surround sound and outside speakers, microwave, oven, 3 burner gas range, double door refrigerator UPGRADED to the larger fridge water heater bypass, bathroom power vent, skylight in tub/shower, tub surround, black tank flush, UPGRADED to skylight in kitchen, UPGRADED tri fold leather couch, UPGRADED Corian counter tops, Larger BTU air conditioner, 2 6 volt deep cycle batteries, cloth night shades, swing out rail assist, aluminum rims, 30 amp service, 2 30lb propane tanks, rear ladder, TONS of storage, Pics available would only allow me to post 10 pics. NOT INCLUDED - bike rack and TV. Please call 403-866-0668. 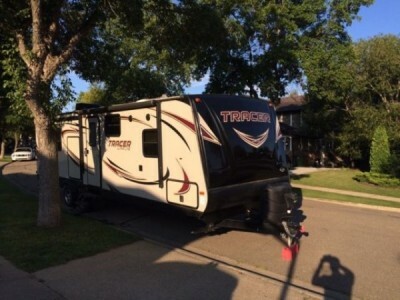 2015 Forest River Tracer 2850RED Ultra Light Trailer. ultra light used 6 times. Transferable Warranty. Solar charger kit. Under coated. Extender sewer hose. In perfect condition. Please call 780-887-5363 for more info. 2010 Open Range 393RLS Fifthwheel. Original owner, 36.5ft 5th wheel w/rear living quarters. 4 seasons package, 4 point leveling, 2 A/C units, dual batteries, inverter, 12cu.ft. double door fridge/freezer, 4-20lb propane bottles, prepared for washer/dryer and gen set. 10500 lb dry weight, non smoking, no pets. Balance of extended warranty available. Please call 780-819-3733 for more ingo. 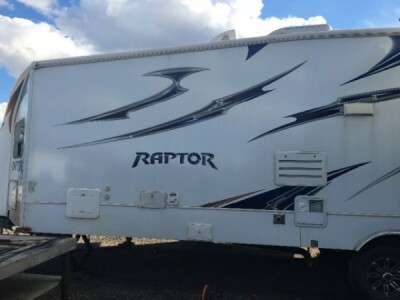 2012 Keystone Raptor RP30FS Trailer. Excellent condition, downsizing! 30ft. Please call 780-991-6766 for more info.